Sleek, High Performance Racer. Pedal your way to the finish line! This beautiful racer by Radio Flyer features real air tires for high performance traction and handling. It offers a 3-position adjustable racing seat, so it can grow with a child, a real working hand brake and clutch for free-wheeling fun. The body measures 21" x 23" and weighs 35lbs. For ages 3-7. Extra shipping charge $5.00 due to weight. No express delivery. Park their stuff in fire truck accessories. 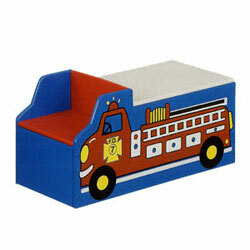 Fire truck storage bin is built tough to hold all of their favorites. Bin has 2 wheels and a handle to make it easy to move around, plus, a separate compartment for books in front. Assembly is required. Fiberboard construction with screen printed detail. 30" W x 17"D x 17"H. Imported. Winner of the Today Show Toy Contest, the Parent's Choice Gold Award and named one of the Best Toys of the Year by Parenting magazine. This giant block is for building - building fine motor skills, language skills, and a love of music and language! Jam-packed with fun, color, and activity, it's a classic developmental toy with the added benefit of music. Each side of the giant block plays two children's songs - toe-tapping classics and jazzy tunes that entertain children while reinforcing shape learning and language skills. Each side also features a colorful geometric shape and a secret surprise pocket. Zippers, snaps, and buttons develop fine motor skills and challenge children to uncover whimsical activities including a shiny peek-a-boo mirror, an ABC and 123 book, and a wiggly busy ball. Awarded the Parent's Choice Gold Award and one of the Best Toys of the Year by Parenting magazine. Takes four C batteries, not included. 14" square. Ages 1 year and up. That'll Be 15 Cents, Please. Our solar powered cash register/solar calculator combines the fun of playing more with the value of learning math skills. A recipient of many awards, including the Oppenheim Best Toy award, this cash register helps young entrepreneurs learn basic calculator skills, money recognition, addition and subtraction. It features oversized buttons and a big digit number display. Play money and credit card included. Size: 10 1/2" W x 5 3/5" H x 9 1/2" D.For ages 3 to 8.Also available is our talking scanner that will "scan" pretend UPC labels and will randomly say prices aloud at the touch of a button. Price appears on the digital display, ready to be typed into the cash register to total up purchases.Requires 2 "AA" batteries, not included. This item includes 25 durable, solid wood block pieces to match and stack. Great for building early shape, color and size sorting skills! Ages 2 and up. Sized 11"" x 8.5"" x 3.5"". Great for Montessori, Waldorf or Preschool environments! Made by Lights Camera Interaction. Grandma, Where's Montana? This hugely popular, colorful and educational U.S.A map puzzle is made of top quality wood. Each state shows the capital, major resources and attractions. Size: 12" x 18". For ages 5 to 9. Thomas The Tank Fans Will Love This 5-Car Gift Pack. This new Sodor Gift Pack brings the story of Thomas The Tank engine to life by including his friends -- Henrietta, Bertie, Oliver, Fred and Toby. Add some expansion track and this makes a terrific gift set. For ages 2 to 7. Remember Building Your First Log Cabin? Here's a construction toy sure to bring you down memory lane. Around since 1930, this 92-piece log cabin construction set lets kids build a log cabin with green plank roof, red chimney and fences. 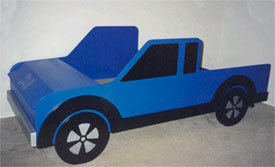 The pieces interlock so building is easy even for young children. Made of solid pine and finished with brown, red and green non-toxic dyes. Made in the USA. For ages 3 to 7.